If there was a golden age of secondhand bookshop browsing, for me it fell between 1995 and 2000, though the afterglow lasted through to 2005. The book I’ve chosen is far from being a gem in physical appearance, but it marks the moment of transition. 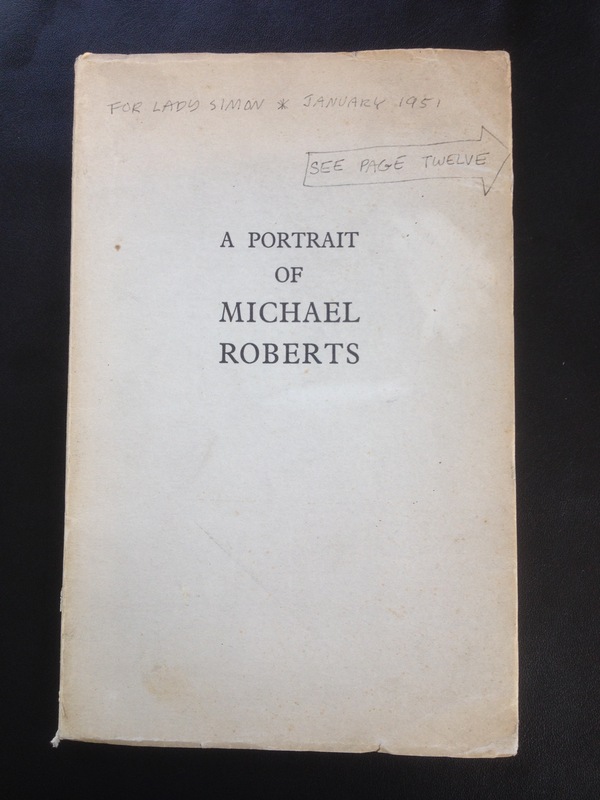 I picked up A Portrait of Michael Roberts (1949) for thirty-five Canadian dollars while I was in Victoria, British Columbia, in May 2000; I was there for three weeks working with Herbert Read’s papers in the University of Victoria. While I was there, one of the archive assistants mentioned a new online website that catalogued the holdings of antiquarian booksellers around the world, and which coincidentally was based in Victoria: abebooks.com. Until then secondhand bookbuying had been serendipitous and speculative. My golden age began in January 1995 because that’s when I started my first properly paid and full-time post as a lecturer, at the University of Wales Bangor. I paid quite a few visits to my friends A— and A–, who had recently moved to Hereford, and Hereford put me in reach of Hay-on-Wye; sometimes as a day trip from their house, sometimes as a detour on the way. Book-browsing at Hay was a full sensory experience: not just the sight of books, but the chill of basement rooms, the creaking of old doors, and the smell of slightly mildewed pages. I came back with all sorts of wonders. They were mostly, I now realise, belated acquisitions of books I had focused on when doing my doctorate. (Moving to Bangor deprived me of the resources of the Bodleian, so I was trying to compensate). But some others were speculative purchases of works for future reading and study. The coming of ABE made it far easier to find obscure titles and to be sure that you weren’t spending over the odds for a given book, but it removed the excitement of serendipity and foraging, and it removed the sensory engagement in the quest. The element of speculative thinking about what you might need has been displaced by the instrumentalised search for what you do need in the present moment. 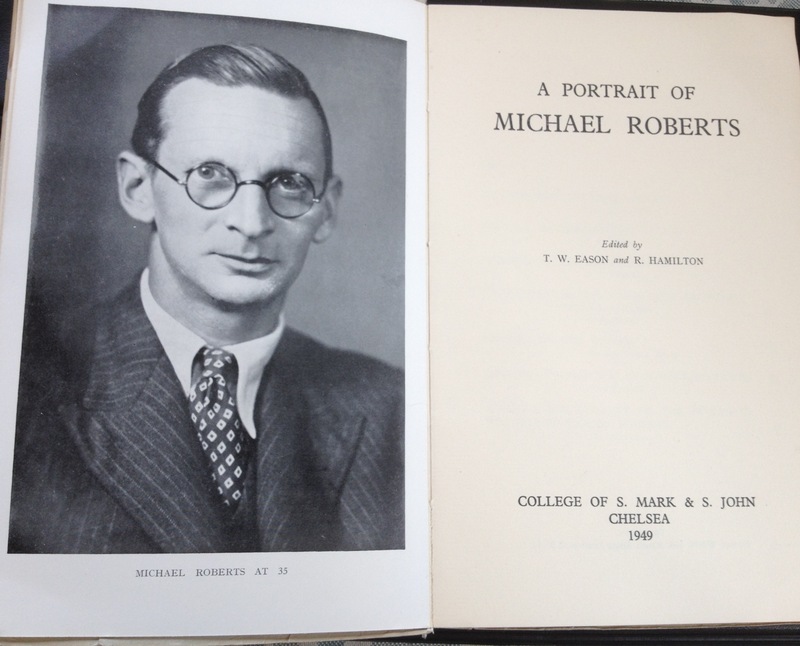 A Portrait of Michael Roberts was published by the College of St Mark and St John, then an Anglican teacher-training college in Chelsea; it later relocated to Plymouth, and became the present-day University of St Mark and St John, popularly ‘Marjon.’ Roberts had become its Principal in 1944, but his career was cut short by his being diagnosed with leukaemia; he died in December 1948. The book I found in Victoria came with a mysterious inscription on the front over “FOR LADY SIMON * JANUARY 1951” and a big arrow saying “SEE PAGE TWELVE.” The arrow refers to the start of M. F. Cunliffe’s chapter about Roberts’s time as a teacher at the Newcastle Royal Grammar School, but whether Cunliffe was the presenter of the volume I’ve no way of knowing. When I bought the book I’d not heard of Lady Simon, but have since found out she was the Manchester-based politician and educational reformer Shena Simon, Lady Simon of Wythenshawe (1883-1972); how her copy of the Portrait found its way to Canada is also something of a mystery. I came to hear of her again because my partner studied for her A-levels at the now-defunct Shena Simon College in central Manchester. My copy of the book isn’t a gem in any conventional sense, but it knots together several important threads. This entry was posted in Books and tagged bookaday, Michael Roberts, Secondhand books, Shena Simon on 11/06/2014 by michaelwhitworth. Do I have a ‘favourite author’? It’s a professional hazard of being a lecturer in English literature that ‘favourite author’ becomes an unwieldy implement, an unusable tool. I’ve no problem with the idea of value or with admitting that I like some authors more than others, but to single out just one is impossible. That’s partly because I like them for different reasons and in different modes and moods. Professionally, I enjoy giving tutorials on some, enjoy giving lectures on others; enjoy researching some, and enjoy writing about others. Personally, poetry and narrative treat me differently; linguistically innovative poetry touches different parts of the self from conventional lyric. Some works I enjoyed reading when I was a student, and so I cherish the memory, but I wouldn’t necessarily want to go back to. (New category: Favourite author you could happily never read again.) And working professionally with literature means makes it harder to have an author who exists in some way privately for me as an irrational and unanalysed preference. 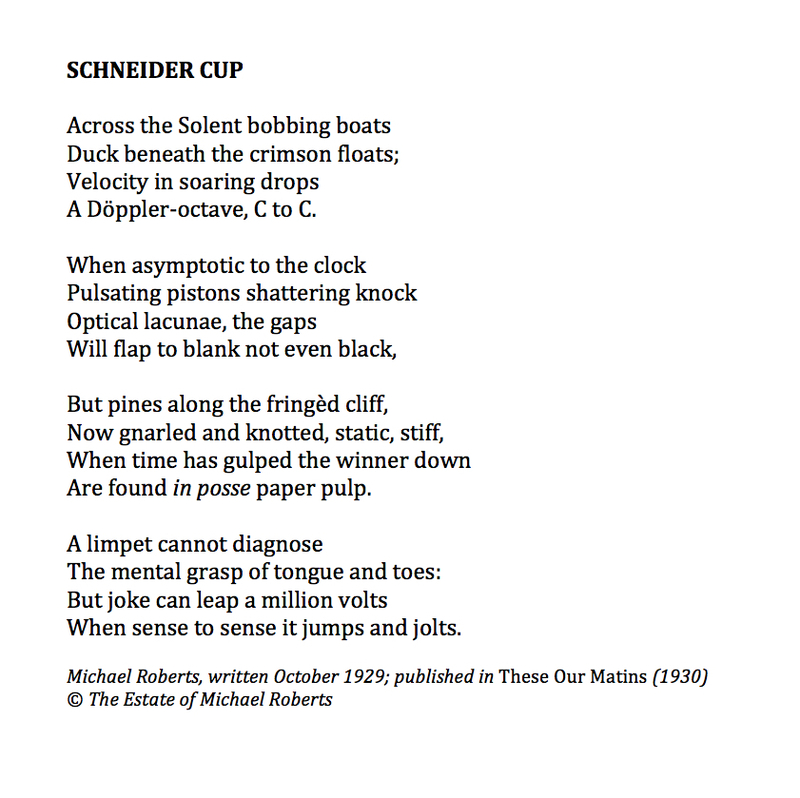 I read it in 1992 when my interests really lay in how Roberts’s poetry related to his education as a scientist: he had studied chemistry at King’s College, London, and mathematics at Trinity College, Cambridge, before embarking on his career as a schoolteacher and, in his spare time, poet and critic. 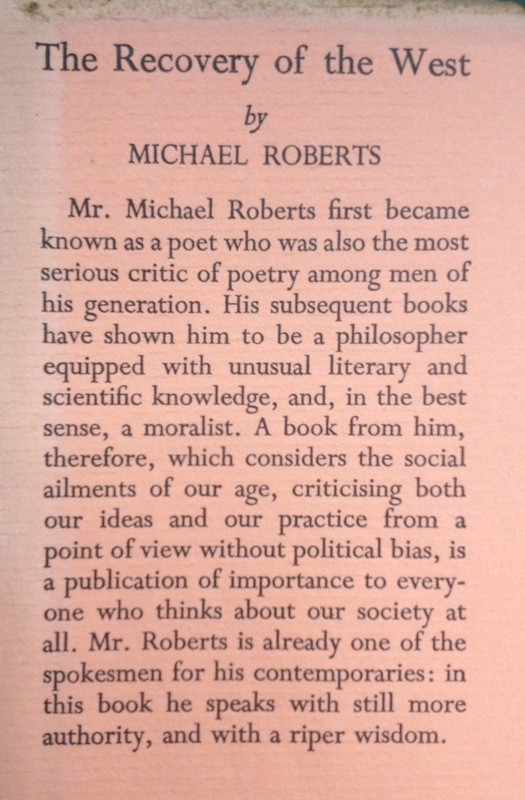 The poems in These Our Matins (1930) show his first efforts in this direction, alongside some juvenilia, and Poems (1936) continues the exploration; his criticism, both in Critique of Poetry (1934) and uncollected essays, frequently invokes science and mathematics as a point of comparison for poetry and the difficulty of poetry. 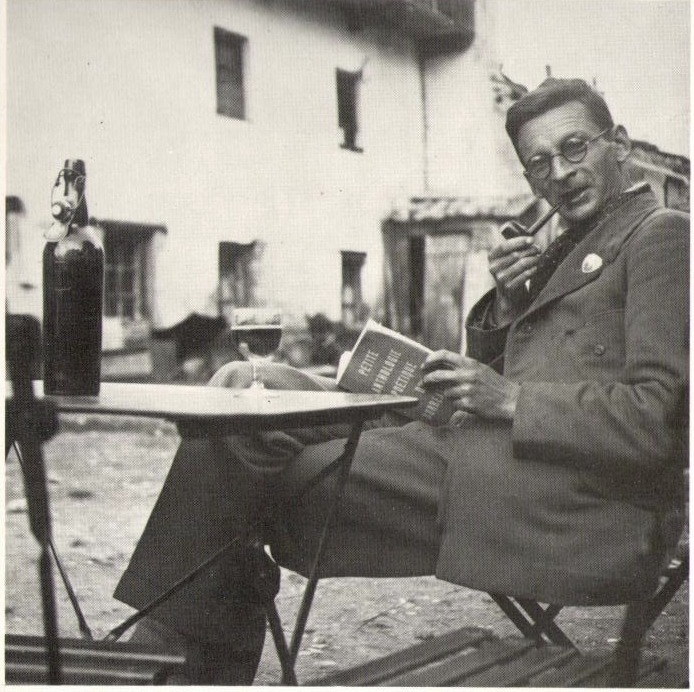 By the time of his 1941 writings, his agenda and mine had parted company: The Recovery of the West wasn’t speaking to my interests. Also, by 1941 he had also become a Christian, and there was something off-putting to me about chapter titles like ‘The Reality of Evil’ and ‘The Need for Christian Doctrine.’ In fact I nearly didn’t select this book, and hence this author, because I feel I know it so little that it doesn’t properly achieve the status of least favourite. I feel bad saying this; I should give it another try, and try to understand it on its own terms rather than mine, even though those terms are very much wrapped up in the contingencies of its historical moment. I’m touched and intrigued by an inscription in a copy that was sent to me out of the blue a few years ago (thank you, Dr H. of Exeter). Roberts and the whole of the Royal Grammar School, Newcastle, had been evacuated to Penrith for the war. This entry was posted in Books and tagged 1941, bookaday, favourite author, Michael Roberts, The Recovery of the West on 04/06/2014 by michaelwhitworth. “Best Bargain” could just lead to an account of book-buying as written by a stock-market dealer. Those £5 pamphlets by J. H. Prynne that now sell for £50 or £100: bargains! (Etc.) But I’m not selling them, so that’s not really the point. I’d prefer to take my measure as the price:pleasure ratio, but even that becomes complicated. 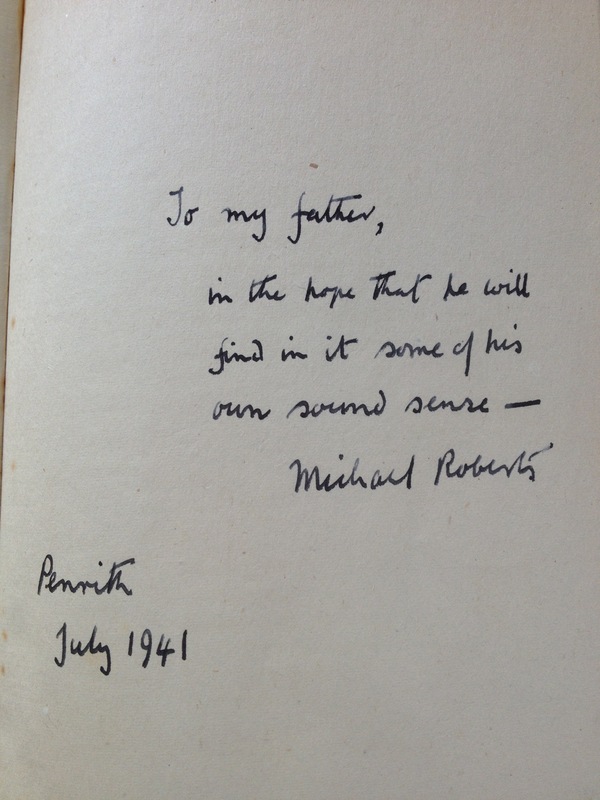 When in 1992 I bought a second-hand copy of Michael Roberts’s Collected Poems (1958) for £30 from Ulysses in Bloomsbury, I’d never previously ventured into an antiquarian bookseller or spent quite so much on a second-hand book; but I was writing a chapter on Roberts in my thesis, and, in the absence of a loanable copy in Oxford, it was necessary and enormously helpful. 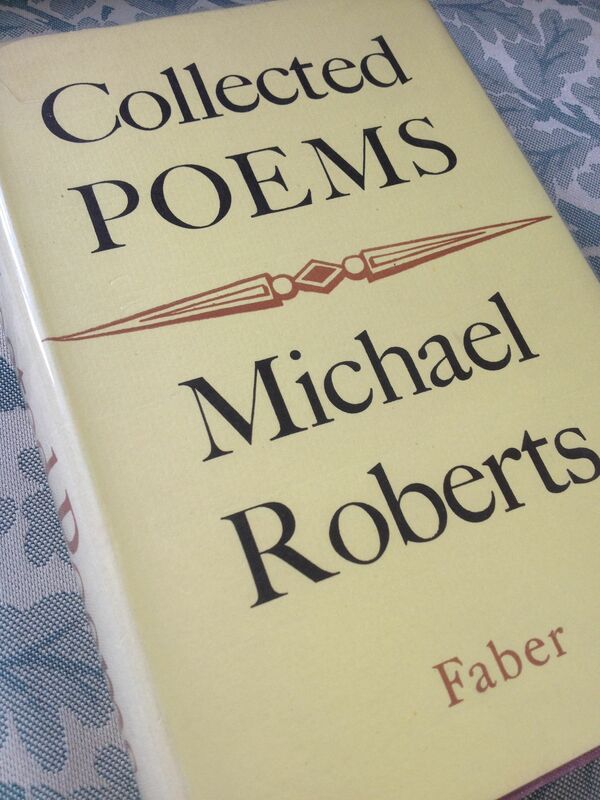 A bargain at the price, but in this case it’s as much a measure of the efficiency it brought to my research as it is of the pleasure of Roberts’s poems. In a similar vein I might mention a secondhand copy of A. S. Eddington‘s The Nature of the Physical World (1928) which I got for £3 in December 1990, in the first term of my doctoral research, and which was completely invaluable then and in writing the book that followed from it. 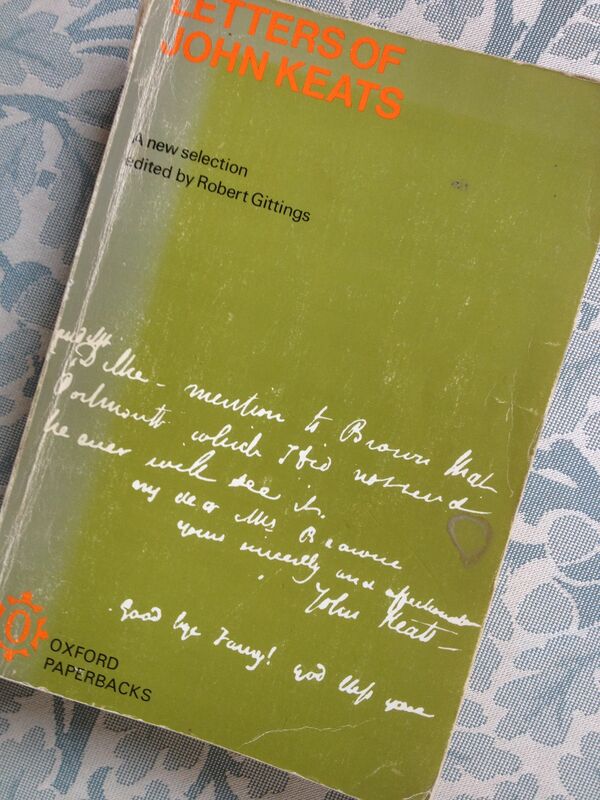 Keats’s Letters I bought in an already battered paperback copy for £1.30 in April 1988 (I systematically inscribed books back then), and battered it some more. An amazing volume for me: we’d studied Keats at A-level, and the Heinemann text we had then contained some of the letters, but to be able to read all of them allowed me to take a completely fresh look at him. The letters were quite prominent in the relevant tutorial essay, but also starting a persisting interest in the letter as a not-quite-literary form, a form that’s marked mostly by its formlessness, and that’s broadened out into thinking about diaries (especially Woolf’s diaries), and having the pleasure last year of teaching a student with really original ideas about Woolf’s letters. But though it’s great to find something secondhand, the real bargains have turned out to be new books that didn’t represent a great outlay at the time, or even seem to be particularly special as physical artefacts, but which opened up a whole new world of literary possibilities. The Collected Poems of Sylvia Plath (£4.95 seemed modest even in 1986); the Penguin ‘corrected’ Ulysses that I got in 1986 or 1987; the later Oxford World’s Classics edition of the same that I got in order to teach my Ulysses module at Bangor; but more than any of those The Riverside Chaucer, £8.95 in 1988, which served me well through the medieval period paper and the Special Author option on Chaucer. 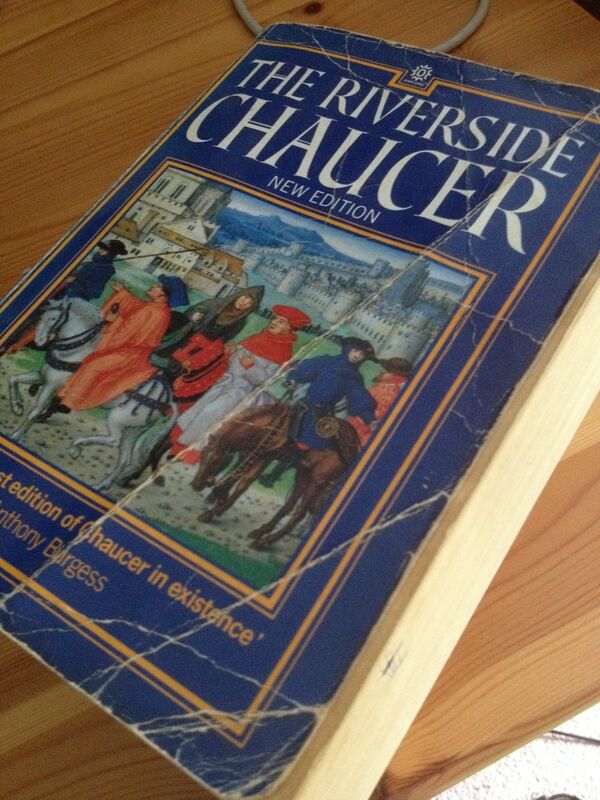 Chaucer isn’t my favourite medieval poet, but the Riverside edition was a bargain, both for the range of poetry in it and for the compacted density of scholarly information in the notes. This entry was posted in Books and tagged bookaday, Chaucer, John Keats, Michael Roberts, Riverside Chaucer on 02/06/2014 by michaelwhitworth.